ALL ages and abilities welcome on all dates. Lots of cakes and hot drinks for riders and supporters on Jump Training days at Garnders Farm, Hullavington. Saturday 26th January *FULLY BOOKED* – Gymnastic Jumping Training 9am-4pm at Gardners Farm, Hullavington. Focusing on ‘riding good lines’ and footwork. £25pp – 30minute INDIVIDUAL sessions or 1hr SHARE with a friend. Wednesday 6th February – Polework afternoon 1-4pm at Gardners Farm, Hullavington. Lots of Poles and exercises, incl raised. I can incorporate some small jumps for those wanting to jump. £25 30minute INDIVIDUAL, £35 45minute INDIVIDUAL or £50 1hr SHARE with a friend. Saturday 9th February *LAST FEW SPACES AVAILABLE*- Gymnastic Jumping Training 9am-4.30pm at Gardners farm, Hullavington. Focusing on simulated XC incl skinnies, corners, bounces and abc combinations. £25pp – 30minute INDIVIDUAL sessions or 1hr SHARE with a friend. 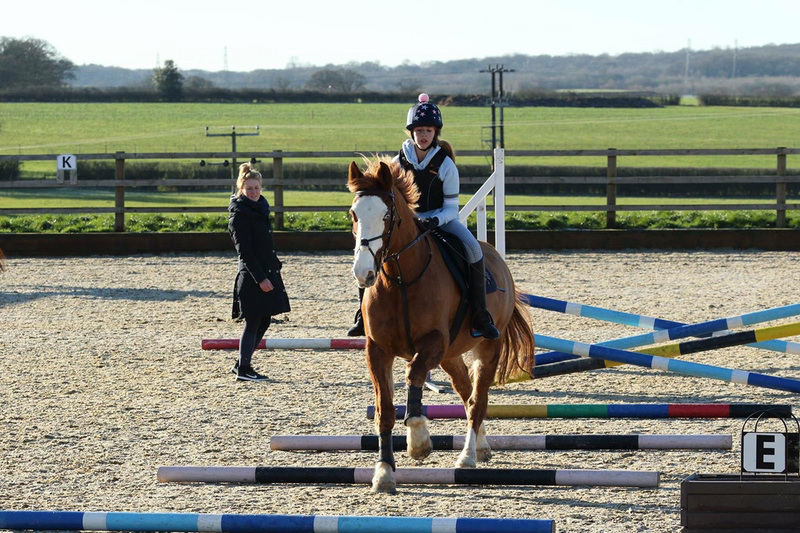 Sunday 10th February – Cotswold Edge Riding Club Showjumping Training 12-3pm at Charlton Park, Malmesbury. Please contact Cotswold Edge RC direct for bookings. Tuesday 19th February – XC Training Day 12-4pm at Rabson Manor, nr Swindon. Rabson Manor has a huge variety of XC jumps from 40cm-110cm. A great venue for introducing young or inexperienced horse/riders to XC, and more experienced horse/riders to practice for the upcoming Eventing season. £45pp – 1hr GROUP (includes XC hire, max 3 in a group). Thursday 21st February – Polework afternoon 1-4pm at Gardners Farm, Hullavington. Lots of Poles and exercises, incl raised. I can incorporate some small jumps for those wanting to jump. £25 30minute INDIVIDUAL, £35 45minute INDIVIDUAL or £50 1hr SHARE with a friend. Saturday 23rd February – Gymnastic Jumping Training 9am-4.30pm at Gardners farm, Hullavington. Putting it all together, SJ course practice. £25pp – 30minute INDIVIDUAL sessions or 1hr SHARE with a friend. Sunday 3rd March – XC Training Morning 9am-12noon at Rabson Manor, nr Swindon. Rabson Manor has a huge variety of XC jumps from 40cm-110cm. A great venue for introducing young or inexperienced horse/riders to XC, and more experienced horse/riders to practice for the upcoming Eventing season. £45pp – 1hr GROUP (includes XC hire, max 3 in a group). Wednesday 6th March – Polework afternoon 1-4pm at Gardners Farm, Hullavington. Lots of Poles and exercises, incl raised. I can incorporate some small jumps for those wanting to jump. £25 30minute INDIVIDUAL, £35 45minute INDIVIDUAL or £50 1hr SHARE with a friend.